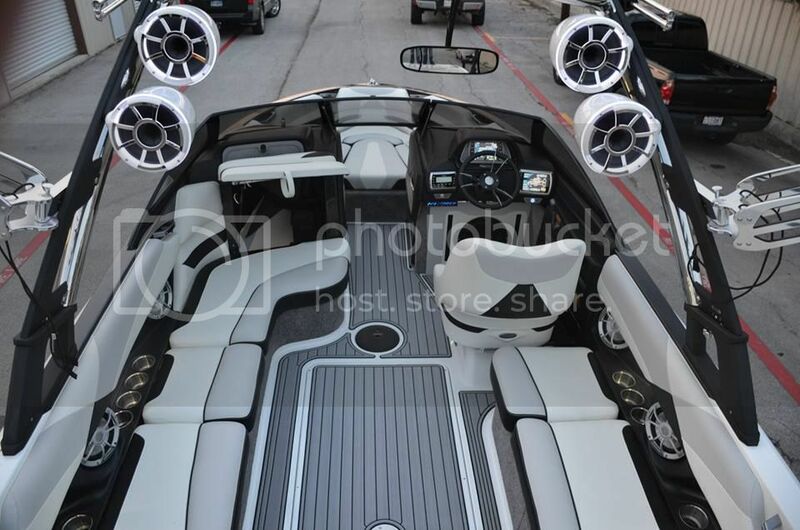 How do you guys think seadek would look in an 07 23LSV? I'm considering the project. I'm unsure how it would look having carpeted seat bases. I'm tired of having all carpet. Opinions? Wow! 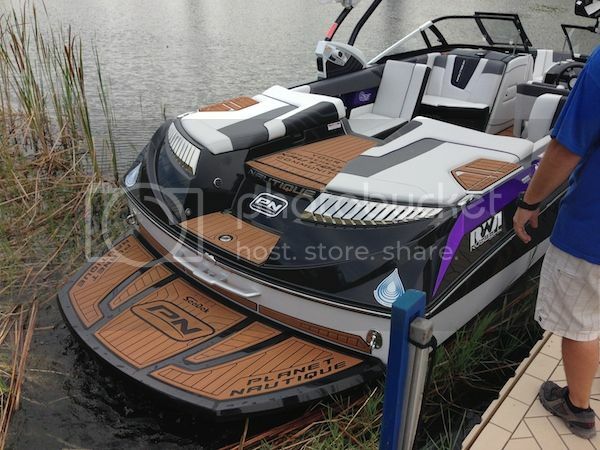 Malibu should offer this as a factory option. I bet they do eventually. How does the Seadek hold up over the years? Long term like 10yrs. That looks great. 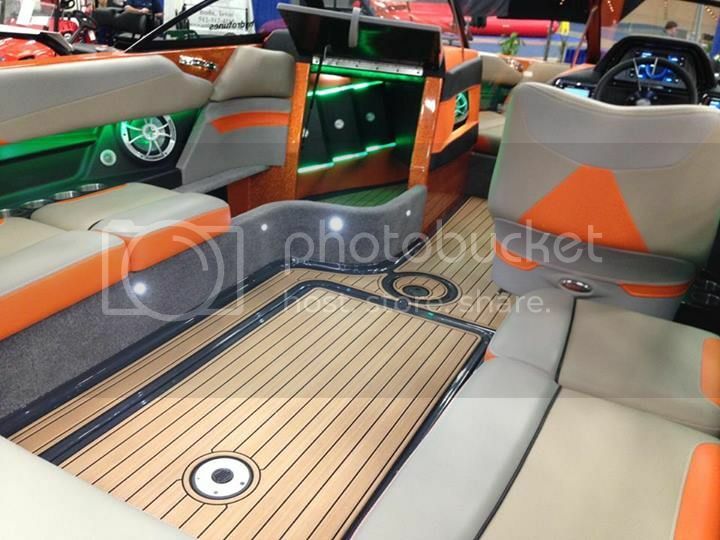 Saw a thread on WW of Nautique that went with wood looking seadek, looked cool. Holds up good same as your swim deck pad, just keep cats away from it they will screw it up with claws! I think that an 07 has that black plastic stuff for a floor not gelcoated like the picture, so it won't look like that. I could be wrong but I would find out before I tore the carpet out. that looks terrific! DIY? Dealer? Not mine... That's a Hydrotunes install. I've had both the gray you see here and now the brown... Absolutely love it. So does everyone who has it or been on it. Anyone have more info on what I may run into under my carpet? I was wondering if I might could get some of that white trim around the seat bases to do on mine to kinda clean it up a bit. I wouldn't be able to have any gaps in mine where you see the white. I imagine it would have to be one solid piece. I think the thread was on Tigeowners where someone used an epoxy coating to finish their floor, came out very nice. As I understand it, the seadek is a lot like the swim step pad. I know my swim step gets HOT as a mutha. I wouldn't want that on my boat floor. Looks nice and I like the idea but I'd have to be proven wrong about surface temps on a 100*+ day. If its anything like my garage floor epoxy, it'd be slip central. Even with the anti slip in it. True, they used it as a prep after pulling up carpet and it went underneath the new flooring. So what happens when I pull my carpet up and think oh $h!t and run into something unexpected? Any advice on what to put down around the seat bases as "trim" to kinda dress it up a bit? I'm going to order the seadek and get started I believe. We'll let it be so. Gets nowhere as hot as the gray Malibu carpet, not even close. And I am talking up to 120degs. Gray Malibu carpet would get so hot I used to keep a bucket to dump lake water on it because the kids would burn their feet. Not with Sea Deck. You go thru a process of 2-3 fittings with patterns, you measure, they send a pattern, make adjustments, repeat etc... Before you pop $$$ for the final sea deck. If you have issues it's really your fault. Go slow, follow their process, and you'll have a terrific result. my guess is the floor will covered in glue from the carpet and basically look like crap. 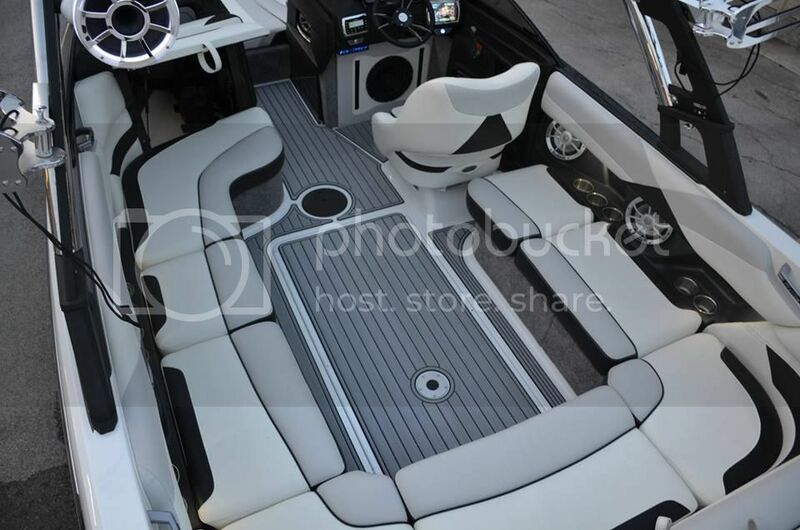 i saw on WW where a guy used an epoxy type bedliner to cover the floor before putting down the seadeck. He used Monstaliner, buy you will need to do a bit of prep work if the floor is not smooth since the bedliner will prob just make it more prominent. if you have a color scheme that wont at all support the brown, then by all means go with the gray. Nothing wrong or bad with the gray per se.... but the general feedback is that the gray lacks warmth in the color pallet.... and it can feel like a sea of gray, its a strong gray. Feels like gray. Hard to articulate until you sit in the boat. The brown starts off a super strong bright brown when applied new as seen in the photos earlier... and then it softens some in color... I am not talking a hard fade or anything like that... but softens the brown some after a few weeks of use and sun exposure and really looks great. My boat is black and white... a few gray vinyl accents inside.... I went with the brown and very glad I did.... counter-intitive to what most folks would assume gray would be the natural choice. Allllll subjective here.... but thought I would pass along. I would add pics of my boat on here but It seems like I've been blocked by admin. I have never put anything bad on here so idk why.